Beautiful setting on the Intracoastal Waterway! Property 1: Beautiful setting on the Intracoastal Waterway! Perfect Location! Beautifully Updated Canal Home! Property 2: Perfect Location! Beautifully Updated Canal Home! Beautiful and Beachy 4 Bedroom, 3 1/2 Bath Home With Access to Private Day Dock and Easy Beach Access! Property 3: Beautiful and Beachy 4 Bedroom, 3 1/2 Bath Home With Access to Private Day Dock and Easy Beach Access! NEWLY RENOVATED 2017 CANAL HOME ONLY 2 BLOCKS WALKING DISTANCE TO THE BEACH! Property 9: NEWLY RENOVATED 2017 CANAL HOME ONLY 2 BLOCKS WALKING DISTANCE TO THE BEACH! Family friendly house with dock space available! GREAT VIEWS OF ATLANTIC OCEAN! Property 11: Family friendly house with dock space available! GREAT VIEWS OF ATLANTIC OCEAN! NOW PET FRIENDLY! "Buck Stops Here" - Relax and breath in the salt air from the ocean facing front porch of this 2nd Row home on the West End. Property 12: NOW PET FRIENDLY! "Buck Stops Here" - Relax and breath in the salt air from the ocean facing front porch of this 2nd Row home on the West End. Welcome to "Seven Seas", a lovely beach home with Private beach access just across the street & use of a private day dock on the Intracoastal Waterway. Property 15: Welcome to "Seven Seas", a lovely beach home with Private beach access just across the street & use of a private day dock on the Intracoastal Waterway. Property 17: Miles of Sand and Sea Shells. Perfect 2nd Row Family House. "Changes in Altitude/Changes in Attitude" is a lovely 3 bedroom, 3 bath waterfront canal home, just steps away from convenient beach access! 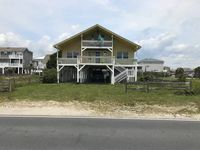 Property 18: "Changes in Altitude/Changes in Attitude" is a lovely 3 bedroom, 3 bath waterfront canal home, just steps away from convenient beach access! "Kitty's Place" is a Fantastic Beach Cottage with Easy Beach Access directly across Ocean Blvd West! Property 21: "Kitty's Place" is a Fantastic Beach Cottage with Easy Beach Access directly across Ocean Blvd West! Relax in our Charming House with community pool in Summer Place at OIB! Property 26: Relax in our Charming House with community pool in Summer Place at OIB! Property 28: Oceanfront, rustic modern treehouse on the beach, open, airy, with great views. Canal Front Home with Boat Access & Golf Cart! Very Close to Beach Access! Property 31: Canal Front Home with Boat Access & Golf Cart! Very Close to Beach Access! Newly renovated, ocean front, pool (optional to heat) home with private beach access and spectacular views of the Atlantic! Property 33: Newly renovated, ocean front, pool (optional to heat) home with private beach access and spectacular views of the Atlantic! 4 bedroom 3.5 bath family home, easy access to Ocean Isle Beach! Property 35: 4 bedroom 3.5 bath family home, easy access to Ocean Isle Beach! "Miss Me Yet" - Canal Front Beach Cottage With Private Dock - Bring the Boat and Bring Fido! A great Pet Friendly option for your beach vacation! Property 36: "Miss Me Yet" - Canal Front Beach Cottage With Private Dock - Bring the Boat and Bring Fido! A great Pet Friendly option for your beach vacation! Dock Holiday! A beautiful 5BR/5BA Canal home with great beach access. Property 38: Dock Holiday! A beautiful 5BR/5BA Canal home with great beach access. Fall Stays at OIB are heavenly! Book your get away weekend today. Property 39: Fall Stays at OIB are heavenly! Book your get away weekend today. Cozy Canal Beach House with a Private Dock Close to the Beach. Property 40: Cozy Canal Beach House with a Private Dock Close to the Beach. Stunning Island Park Home with Private Dock! Only the Birds have Better Views! Property 41: Stunning Island Park Home with Private Dock! Only the Birds have Better Views! Beachhaven! Delightful Beach Cottage perfect for a relaxing beach vacation! Property 42: Beachhaven! Delightful Beach Cottage perfect for a relaxing beach vacation! New Listing! Cozy Coastal Cottage. Property 44: New Listing! Cozy Coastal Cottage. 96 footsteps from house to beach! Newly renovated! Property 46: 96 footsteps from house to beach! Newly renovated! Welcome home to "Serenity West", a beautifully renovated and updated beach home featuring all new baths, flooring, fresh paint and new furnishings for the 2018 Vacation Season! Property 47: Welcome home to "Serenity West", a beautifully renovated and updated beach home featuring all new baths, flooring, fresh paint and new furnishings for the 2018 Vacation Season! Property 48: Just a short walk from the beach! Kid friendly neighborhood, guest only pool. Family Friendly Beach House. Light, open and sunny. Very close beach access. Property 49: Family Friendly Beach House. Light, open and sunny. Very close beach access. Lovely Oceanfront 3 Bedroom Cottage with private walkway to Beach in the quiet West End! Property 50: Lovely Oceanfront 3 Bedroom Cottage with private walkway to Beach in the quiet West End! The home is located in a peaceful community and is very welcoming. We thoroughly enjoyed our stay. The home is located in a very quiet community and is very welcoming and close to many local beaches that are clean and not crowded. It was nice to wake up every morning to the sounds of birds chirping and not traffic noise. We loved that you could see the Inter coastal waterway from the deck and really enjoyed our stay. Could use more items in the kitchen, i.e. pots pans utensils. But, overall decent.